Mary of Bethany is gloriously unrestrained at Jesus’ feet. Fragrance fills the room as oil pools on the floor. The senses are engaged – sight, sound, smell, and touch. She’s impossible to ignore. Being there must have been wild. Socially awkward, for sure. She was touching a man, lavishing him with adoration and oil in plain sight of everyone else at Lazarus’ back-from-the dead dinner. Just before the sensual ritual of anointing feet with hair and perfume, Mary’s brother Lazarus had died. She wept at Jesus’ feet at the edge town. When Jesus finally showed up, she ran to meet him and knelt on the ground – holding him accountable for not being there as Lazarus took his last breath. Jesus cried with her. And then he raised Lazarus from the dead. The Gospel of Luke describes yet another moment when Mary of Bethany was at Jesus’ feet. This time, though, her pose was scholarly as she listened to what he was saying. In that moment in Luke, Jesus affirmed her spot on the floor as a good thing. 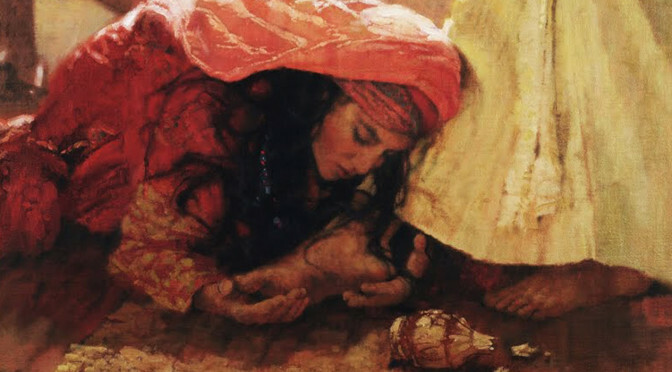 Mary of Bethany spent a lot of time at Jesus’ feet. She learned at his feet. She wept at his feet. She oiled his feet in adoration, anointing him for death. I’ve been wondering what Mary of Bethany’s adoration looks like for us today. There are things we do in worship that infer adoration. We turn toward the cross as it is carried in and out of the Sanctuary. Our praise-filled hymns and psalms raise a joyful noise of adoration. Some of us meditate on various crosses during worship while we sing, or commune, or confess the faith of the church. Some of us kneel as we’re able to receive Jesus in the bread and wine of communion. Being in worship together is a moment to adore Jesus in ways as old as God has been worshipped. Surrendering as Mary did to the unconditional grace of Jesus. Not solving the mystery of God in human form but entering into the mystery by faith. It’s a wonder that Mary of Bethany doesn’t get more of our attention. Scholarly, passionate, and unrestrained, she’s a gift to all of us who struggle to embody the liveliness of the faith within us. I can make a few guesses as to why but it’s probably better to let Judas have a go at it. Honestly, I don’t really want to give Judas the time of day in this sermon. He can take a hike as far as I’m concerned. It’s boo-and-hiss the moment Judas opens his mouth. Information about betrayal and thievery stuck in those parentheses in the reading incite that reaction. Judas’ words sound like a noble church leader guiding the flock to do-goodery on behalf of people living in poverty. But. Jesus. Knows. Better. Jesus paraphrases a bit of Deuteronomy that talks about the people who will never cease to be in need and the Lord’s command to “open your hand to the poor and needy neighbor in your land.” Then Jesus tells Judas to leave Mary alone. We can comfortably point at Judas the way he was pointing at Mary. But I want to spend a little time in Judas’ shoes. Let’s wonder about the way he portrays righteousness to hide whatever is dark inside. Whatever is dark inside takes cover in those parentheses. Like those parts about Judas’ betrayal and his embezzlement from the common purse. He has some pretty big things going on in those parentheses. What I want us to consider is that we have parentheses of our own. The dark inside ourselves that struggles to love God, love self, and love neighbor. The dark place that kick starts its own agenda while looking pretty righteous on the outside. The part that takes other people down because their unrestrained adoration is too much for us to bear. Extravagant grace is often label as offensive or, at the very least, not normal. Think back to last week and the father running with flying elbows and flapping robes toward his wayward son. Undignified right through the massive hug and undeserved party including a main course of fatted calf. Like Judas, we see an act of grace and define it as excessive. This puts it far away from us in a category of giving we label as extreme. As in, not part of how we see ourselves. Judas’ petty righteousness stands in stark contrast to Mary’s lavish devotion. Mary’s lavish devotion fills the room and the senses. At the same time, she points us toward a death on cross that won’t smell near as pretty. The Gospel of John repeats a similar logic of contrast from its opening verses to its ultimate message of Jesus lifted on a cross and drawing all people to himself. Bringing Lazarus back to life intensifies the pace to that cross as some are drawn to faith and others begin to plot Jesus’ death. Today’s reading tells us that Passover, the night on which Jesus is betrayed, is only six days away. The story is building to Jesus’ inglorious end that reveals his glory. Next Sunday we’ll hear about his triumphal entry into Jerusalem. Then he’s just a foot-washing away from being taken into custody to stand trial. In the meantime, we witness Mary’s moment of adoration of Jesus right down to the tips of her hair. One way into adoration for us is poetry. Psalms and hymns are poetry. As are the haikus we’ve been invited to write leading up to Holy Week. Haiku is short, non-rhyming verse made up of three lines – five syllables in the first, seven syllables in the second, back to five syllables in the third and last verse. Those details are also in the worship announcement page, Friday’s e-mailed E-pistle, and the April Tower newsletter. Take a few moments this week to write a haiku in adoration of Jesus with whom we travel to and through the cross into new life. Mary of Bethany’s excess also invites our own extravagance toward Jesus in this season. Lent is a time of sacrificial giving and a time of adoration. Both of which Mary exemplifies in her discipleship. in humble awe, we hail thy presence now. be thou the sweetness we were meant to find. blest evermore with thy full glory’s sight. Amen. Submit a haiku or two about Holy Week anytime between Sunday, March 31 and Good Friday, April 19. Haiku is a 17-syllable verse form consisting of three lines of 5, 7, and 5 syllables. Haiku will be shared via Augustana’s printed and online publications. OR e-mail it to Lyn Goodrum (goodrum@augustanadenver.org). Heard upon that wooden cross. No! It’s just begun . . .